The Tempo is equally suited to recording vocals or podcasts, or web and video chat. NAMM 2012 PRESS RELEASE: MXL Microphones, the professional audio division of Marshall Electronics, has introduced a new microphone that puts studio-quality recording within easy reach of iPad users. 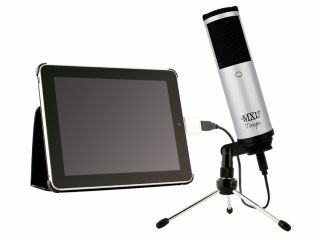 The new MXL Tempo is a USB-powered condenser microphone that enables users to record vocals and other sounds on-the-go when connected via an optional iPad Camera Connection Kit adapter. This lightweight microphone makes it easy to record professional-sounding music and podcasts virtually anywhere without expensive studio equipment. It is also compatible with PC and Mac computers and works with a wide variety of music and chat programs. "More and more recording is being done outside of traditional studios," said Perry Goldstein, MXL's manager of sales and marketing. "In the new landscape of music production, the MXL Tempo is the perfect tool for mobile recording on-the-go." The MXL Tempo features an integrated headphone output that enables monitoring of recordings without going through a computer. The Tempo is currently available in two different colors. The MXL Tempo KR provides a black body with a red grill, while the MXL Tempo SK is silver with a black grill. The Tempo is available now at music stores and computer stores everywhere. Information taken from official press release, for more visit MXL.